A former student opened fire at Marjory Stoneman Douglas High School in Parkland, Florida on Wednesday, February 14, 2018. 17 fatalities have been reported. The shooter is in police custody. A US government panel tasked to study the Parkland high school shooting has recently come up with a surprising proposal for the US school system. Instead of hiring armed guards or introducing other protective measures, the panel's report suggested training and arming teachers who could protect students in case of an attack. State senators in Florida had imposed a ban on the sale of semi-automatic rifles like the one used during the February 14 school shooting spree; the ban lasted all of 15 minutes before it was swiftly rescinded by the very people who passed it in the first place. CNN’s Town Hall on Wednesday titled, “Stand Up: The Students of Stoneman Douglas Demand Action,” got 2.9 million viewers to tune in and watch students who were present at the shooting in Parkland, Florida, last week ask politicians questions on gun reform. But, as one student says, the event wasn’t on the up and up: the questions were scripted. Hysteria over alleged Russian meddling in US affairs hit a new low this week, with claims that Kremlin-controlled internet agents are exploiting the Florida gun massacre. When Free Speech 'Crosses the Line': Does US Need to Tackle White Supremacists? Islamist extremism has been blamed for most terrorist atrocities in the last decade but could things be changing? A man with links to a white supremacist group has confessed to the massacre in Parkland, Florida, last week and it is just the latest in a series of incidents linked to groups violently opposed to Muslims and other ethnic minorities. US President Donald Trump and his wife Melania visited a Florida hospital that treated the victims of the horrific Wednesday school shooting in Parkland, Florida. The president and first lady "paid their respects" to the medical personnel, according to a White House report. A survivor of the recent mass shooting in Florida told reporters her grandfather had had the same experience back in 1949. Florida's Governor Rick Scott called for the resignation of FBI Director Christopher Wray on Friday after the agency admitted that a January tip regarding Nikolas Cruz was not investigated. A shooting on Valentine's day at Marjory Stoneman Douglas High School in Southern Florida resulted in the deaths of 17 people. 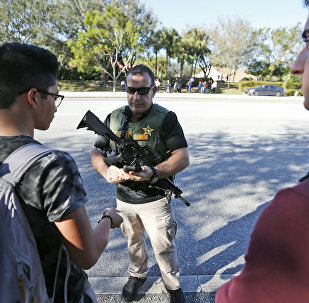 On February 14, in the school in Parkland, Florida, an ex-student opened fire with automatic weapons. As a result, 17 people were killed, five more are in critical condition. Suspected shooter — 19-year-old Nicholas Cruz — was detained and pleaded guilty. 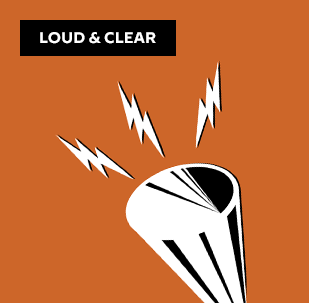 On today's episode of Loud & Clear, Brian Becker and John Kiriakou are joined by Dave Lindorff, an investigative reporter and columnist, and Gilbert Mercier, author and Editor in Chief of News Junkie Post. 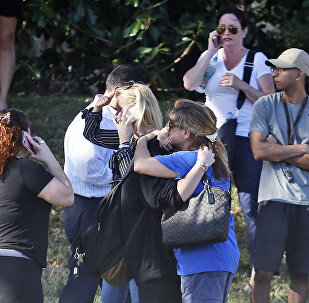 WASHINGTON (Sputnik) - The mass shooting that killed 17 people at a high school in southern Florida prompted US lawmakers on both sides of the aisle to once again demand that Congress act on gun control and the country do something about mental illness. 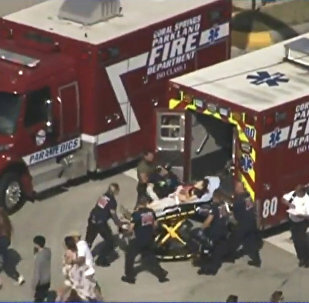 WASHINGTON (Sputnik) - On Wednesday, shooting erupted at Marjory Stoneman Douglas High School in Parkland, located in the southern part of Florida. The 19-year-old former student opened fire with a semiautomatic rifle and as a result of his rampage at least 17 people were confirmed dead by authorities. Nikolas Cruz confessed on Wednesday to being the shooter who killed 17 people at Florida's Marjory Stoneman Douglas High School, according to a Thursday report from the Broward County Sheriff's Office. The suspected assailant who killed 17 people at a high school in south Florida on Wednesday was a member of the white supremacist group "Republic of Florida," which encourages militia training among its members. 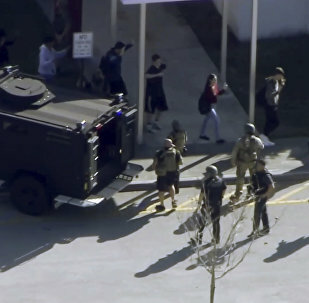 Dramatic video has surfaced online of a SWAT team storming a classroom at Marjory Stoneman Douglas High School in Parkland, Florida, during the deadly shooting there Wednesday afternoon. The shooter, former student Nikolas Cruz, is thought to be in custody. The deadly school shooting in Florida on Wednesday is certain to lead to a chorus of calls for gun bans and a variety of gun purchasing restrictions, but if history is any indication, little will change in American gun legislation no matter the death toll, or the outrage. Numerous outlets reported the identity of the Parkland, Florida, shooter as Nicolas Cruz, a former student. 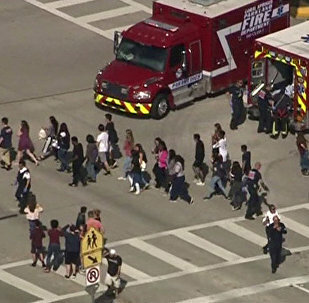 The Miami Herald confirmed that the shooter was an ex-student who was previously prevented from walking onto school grounds with a backpack on. Police have identified the gunman behind a fatal shooting at Marjory Stoneman Douglas High School in Parkland, Florida, as a student at the school and a member of the US Army's Junior Reserve Officers' Training Corps (JROTC) program. The alleged shooter is reportedly alive and in police custody.